THE BODIES OF four climbers were found inside a tent on Everest, an expedition organiser said today, taking the death toll on the world’s highest peak this spring season to 10. The climbers were found at camp four – at 7,950 metres (26,085 feet) – yesterday by a rescue team who were there to retrieve the body of a Slovak climber who died on the mountain on Sunday. “Our rescuers found bodies of four climbers in a tent at camp four yesterday. We don’t have the details of who they are or how they died yet,” said Mingma Sherpa, head of Seven Summits Trek, a Kathmandu-based agency that runs expeditions and rescue operations on the mountain. Both died above the 8,000 metre mark – an area known as the mountain’s “death zone” where oxygen levels fall to dangerously low levels, heightening the risk of altitude sickness. The body of Indian climber Ravi Kumar, 27, was spotted on Monday, two days after he reached the summit and then lost contact. A rescue operation is currently under way to retrieve his body. This season has also claimed the lives of legendary Swiss climber Ueli Steck and 85-year-old Min Bahadur Sherchan, who died attempting to reclaim his title as the world’s oldest person to climb Everest. Irish man John Burke successfully managed to climb the world’s highest mountain last week, and described his final night as “hell on earth”. 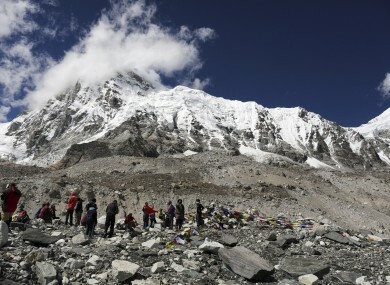 Email “The bodies of four more climbers found inside a tent near summit of Mount Everest”. Feedback on “The bodies of four more climbers found inside a tent near summit of Mount Everest”.